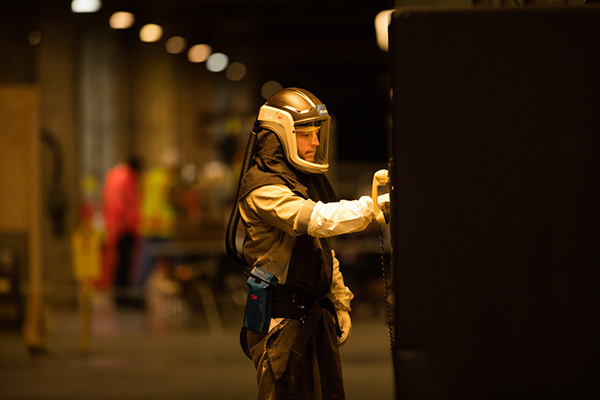 As the Department of Energy (DOE) cleanup contractor, Fluor-BWXT is responsible for the decontamination and decommissioning (D&D) of 415 facilities and structures that supported uranium enrichment operations at the Portsmouth Gaseous Diffusion Plant for more than 50 years. The 3,714-acre plant is DOE’s largest facility under roof, with three large process buildings that house the gaseous diffusion process equipment and span the size of 158 football fields. The plant also includes various support structures that provide feed and transfer operations and site services such as maintenance; steam generation; cleaning; process heat removal; electrical power distribution; and water supply, storage and distribution. During D&D, Fluor-BWXT prepares contaminated facilities for demolition by deactivating utilities and removing stored waste, materials, process equipment such as converters and compressors, and piping. These activities will eliminate groundwater contamination sources, improve worker safety, and reduce surveillance and maintenance costs. Fluor-B&W is currently tearing down 46 support structures under an agreement between DOE and Ohio EPA. In the summer of 2015, the Record of Decision (ROD) was finalized by DOE and Ohio EPA to proceed with a comprehensive plan to demolish the process buildings and support structures at PORTS. Click Here to learn more.